Paris, 14th December, 2018. More and more French and European tourists are choosing Pakistan as a preferred destination for tourism. This was stated by the representatives of the top tour operators of France who met the Ambassador of Pakistan to France Mr. Moin ul Haque in Paris yesterday at a debriefing session after their recent 2-week visit to Pakistan in September, this year. The tour operators in their separate presentations briefed the Ambassador about their visit which gave them first-hand experience of tourism potential of Pakistan. Consequently, they have introduced new tour packages for Pakistan and have also created separate webpages on their website dedicated to Pakistan. In response to this promotional drive, tour packages offered by Clio Travels for 2019 were already sold out, Guide Petit Fute will issue a new edition of its tourist guide book on Pakistan in March, 2019 and will also organize a special exhibition of photographs of their visit to Pakistan. The Ambassador thanked the French tour operators for being a valuable partner in promoting Pakistan as a preferred tourist destination. 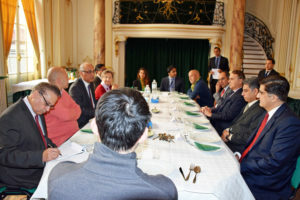 He briefed them about Embassy’s cultural and tourism diplomacy initiatives which included setting a Tourism Desk at the Embassy, launching of a tourism website in French language, holding of International Conference on Mountain of Pakistan in Paris and publication of special dossier on Pakistan in local tourism magazines, newspapers and airing of documentaries on Pakistan on local TV Channels. 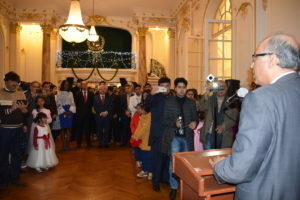 The Ambassador informed tour operators that a dedicated Tourism Office will be opened in the Embassy to further promote cooperation in the tourism sector between Pakistan and France. Paris, 17th December 2018. The Embassy of Pakistan to France remembered the martyrs of Army Public School Peshawar, Martyrs of Kashmiris who lost their lives while pursuing their right of self-determination in Indian held Kashmir and paid homage and respect of the late Pakistanis of Christian faith who had contributed immensely in progress and prosperity of Pakistan. A large number of members of Pakistani French Christian community, faith leaders and as well as parliamentarians, officials of the French Government, civil society representatives and media attended the event which was held in Embassy of Pakisan to France yesterday. At the outset a one minutes silence was observed to pay tribute to the martyrs of APS Peshawar, Martyrs of Kashmiris in IHK and distinguished late Pakistanis of Christian of faith. While addressing the participants, the Ambassador of Pakistan to France Moin ul Haque expressed his deepest sympathies to the bereaved families of the APS incident and condemned this in human act in the strongest terms. 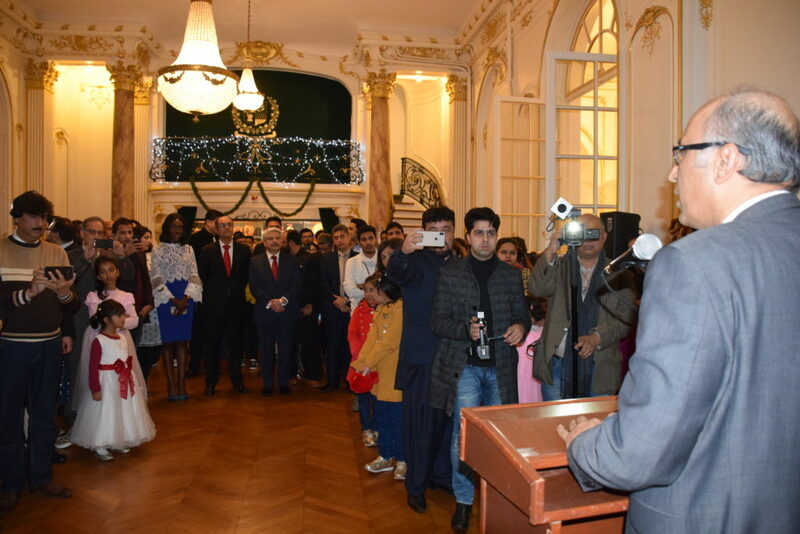 The Ambassador also extended his warm Christmas greetings to the Pakistani Christian expatriates and followers of Christian faith in France and around the world. Recalling the teachings of Jesus Christ, who always stood for love, peace, compassion and righteousness, he said that the spirit of Christmas was about togetherness, sharing, caring and respect for others. The Ambassador also highlighted the role of Christian community in the progress and prosperity of Pakistan as equal, free and proud citizens of Pakistan. He landed their valuable contributions in the fields of educations, judiciary, civil & military service, sports and performing arts. The Ambassador assured the participants that the government of Pakistan is fully committed to promote interfaith harmony amongst adherents of different religions and sects as equal citizens of Pakistan to build a tolerant, multicultural and pluralistic society. Paris, 11th December, 2018. 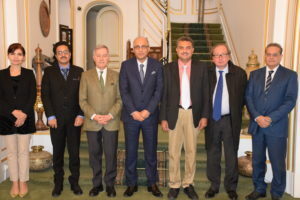 A two-member Pakistani delegation comprising Syed Junaid Akhlaq, Director General Federal Department of Archaeology and Museums and Mr. Zafar Ali Secretary Culture, Tourism & Archaeology of Balouchistan met the Ambassador of Pakistan to France Mr. Moin ul Haque here in Paris yesterday. Mr. Andre De Bussy, Counselor Cultural & Cooperation of the French Embassy in Islamabad was also present on the occasion. The Ambassador briefed the delegation about Pakistan-France cultural relations and various initiatives being taken to further strengthen cooperation in this area. He welcomed the proposed MOU between National History and Literary Heritage Division of Pakistan and Mussee Guimet of France in this regard. The Ambassador noted Pakistan rich history and diverse cultural heritage. Currently Pakistan has six UNESCO World Heritage sites and efforts were being made to inscribe more cultural and natural sites on UNESCO’s World Heritage list. Later, Director General Federal Department of Archaeology and Museums and Secretary Cultural, Tourism & Archaeology of Baluchistan briefed the Ambassador on steps taken by the Federal and Baluchistan governments to promote culture, develop new museums and protect and preserve archaeological treasures of Pakistan. The two-member Pakistani cultural delegation is on a 7-day visit to France organized by the Embassy of France to Pakistan. During its stay, the delegation will hold discussions with the officials of French Ministry of Foreign Affairs, Ministry of Culture, Management of Guimet Museum and archeological experts besides visiting historical and cultural sites of France.